Place all ingredients in a high powered blender. Pulse until combined and small chunks of strawberry remain. Add coconut chips if you like a little extra texture. 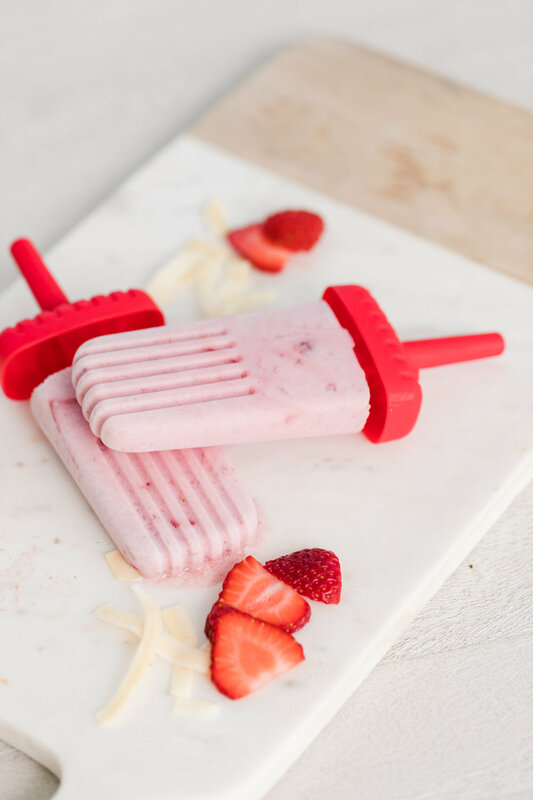 Spoon into popsicle molds and freeze until solid. Makes 6-8 popsicles depending on size of molds. Enjoy! I know, 3 ingredients hardly seems like a recipe, but that is the beauty of fresh, sweet produce! I was inspired after a trip to my locals Farmer's Market and the brightest sweetest strawberries I've ever tasted. I bought way too many, and wasn't in the mood for anything that required heating the kitchen up and viola, these bad boys were born. I'm really on a popsicle kick with this current heatwave, so stay tuned for more, but in the meantime, it doesn't get a whole lot better than these bad boys. They're naturally sweetened, creamy and oh so fresh! A dog obsessed, clean freak and GF enthusiast following my basketball player husband around the US. Constantly seeking the best workouts and restaurants in each city. My goal is to share what I've learned and save you time when traveling, allowing you to enjoy and maintain your healthy lifestyle while at home or on the road. Helping you navigate a healthy lifestyle at home or on the road, saving you time to spend on things that really matter. Surprise! We're having a baby!